I was introduced to Katy through work, and I’m so glad I was. She is definitely a like mind and in hearing about what she enjoys outside of work I’d love the chance to spend some time talking more in depth about her interests outside of work as much as what she does day to day. Let’s get to it! I’m fascinated with the natural world and animals. I collect and assemble objects and environments that remind me of the things that I love and that inspire wonder in me. I don’t have any pets right now, but I’ve raised seahorses, chickens, and Belgian Hare rabbits as pets. I love books, art, and design. Music, of course. My interest in folklore grew out of a love of stories and vernacular. The most moving art exhibit I’ve ever seen is Alexander Girard’s wing in the Museum of International Folk Art in Santa Fe, NM. Girard is one of my heroes. I love to travel and wish that I could afford to experience more of the world. I love making things: crocheting, sewing, knitting, gardening, building, creating. I often feel like I have too many interests and curiosities for the amount of time that I have to explore them. I have a fine arts degree in photography. 18 years ago, when I moved to North Carolina from Oregon with the goal of getting a graduate degree in Folklore, I got an entry-level job in the design and production department at a scholarly book publisher. That job changed my course (for the best–I’m too shy to be a good folklorist) and every opportunity since then can be traced back to the people I met while working there. That was my introduction to print production, bookmaking, typography, graphic design, proofing, and color-management. While there, I became interested in book design and set out to learn as much as I could from the designers. The “logical left-brain, creative right-brain” myth never really resonated with me, even while in art school; my love of art, math, and science didn’t feel like competing interests. I found that I was just as interested in the methodical and repetitive side of production as I was in the creative and intuitive practice of making art. Design, especially book design, is a combination of all of that. There’s almost nothing more satisfying to me than a grid; it doesn’t matter whether it’s a design based on the golden ratio or an Excel spreadsheet. Several years later, when I left the press, I was invited to take over for one of the designers while she was on maternity leave (the same designer introduced me to Laura Ballance at Merge). After that immersion, I began to freelance as a designer; mostly book design and collateral, and–because I had so many musician friends–music packaging. Somehow, in spite of never having been a musician, music has been integral to every phase of my life since I was a teen. In 2007, via word-of-mouth and mutual friends, I was recruited to fill in for Merge Records’ art director while she was out on maternity leave (I don’t know where I’d be if it weren’t for people having babies). The timing coincided with Merge beginning to work on the print for their 20-year anniversary. The majority of my time was spent working on a box set that included 17 CDs, a poster, and a book. I continued to freelance for Merge throughout the life of that project. In 2009, in need of a full-time job, I began working at an ad agency doing prepress, color management, quality control, and software support. I managed the large-format printers and set up the in-house proofing system. When you have clients spending $100k to run a full-page ad in the Wall Street Journal, your processes have to be bomb-proof. I enjoyed the work I did at the agency, but ultimately I was working hard to solve problems for clients who were selling things that didn’t interest me. I worked there for 7 years before moving into my current position at Merge Records in 2016. A typical day might include: scheduling mastering for an artist, ordering lacquers, checking masters, checking test pressings, inspecting finished goods, communicating with artists, print vendors, and pressing plants, preflighting files, checking proofs, requesting estimates, budgeting, brainstorming for packaging and promotional materials, creating purchase orders, placing and tracking orders, reconciling invoices, writing specs. I use Smartsheet to create and track production schedules. For me, the schedule begins with the artist delivering mixes for mastering and ends once the finished goods (CDs and LPs) have been received and inspected. The Merge 20-year anniversary box set was a highlight, for sure. And, within the last year, we raised a significant amount of money for Planned Parenthood and the Southern Poverty Law Center by inviting visual artists to donate works of art to auction off along with a limited-edition Superchunk 7-inch. We just announced a deluxe 4LP/CD box set for Hiss Golden Messenger that includes jackets with debossed front panels and a cloth-wrapped 3-color foil-stamped slipcase. Projects like that are always a lot of fun because we have more freedom to experiment with materials and processes that we don’t use on a regular basis. Of course, they are also the most stressful and risky. Managing the expectations of artists, colleagues, and vinyl consumers. Vinyl is tricky–there are so many things that can go wrong with it and I spend a fair amount of time educating myself and others about all of its idiosyncrasies. 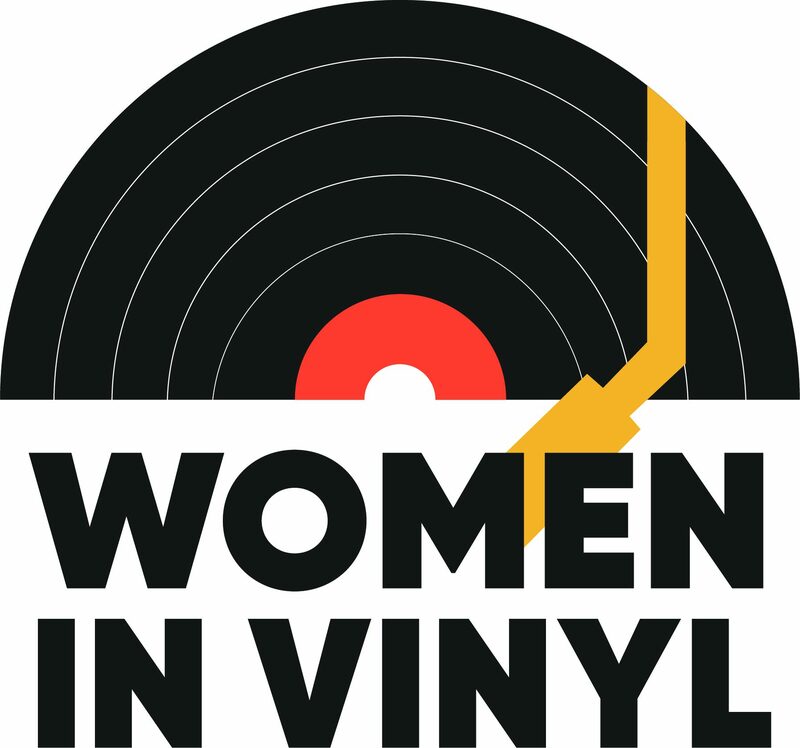 I can’t say it’s something that I (consciously) struggle with on a daily basis, but given that this is a blog about women in vinyl, I do want to recognize the challenge of working in an industry that is historically male-dominated. For me, the bias is especially prevalent when discussing anything technical. Also, the “bro” culture that is shared between male artists, collectors, engineers, and designers can be difficult for women to navigate. There have been numerous instances throughout my career where I have been sharing relevant, thoroughly-researched information and was dismissed, talked over, or “corrected” in a way that I felt had everything to do with my being a woman. It’s rarely appropriate, in that moment, to speak up and call attention to the apparent bias, even though that would probably be the most effective. Thus, I mention it here because it deserves to be acknowledged wherever and whenever appropriate. It’s insidious and unconscious. I rarely experience it in an overt way; it’s usually people with good intentions who are unaware of the way that androcentrism has informed our expectations of one another. There are plenty of instances where women (myself included) are unknowingly complicit for the same reasons. I think we should all be examining the ways in which we communicate in the workplace and asking ourselves how we can help rewrite the script and reprogram our brains. Younger generations are already doing it, effectively. In general: be humble, gracious, curious, and kind and people will remember you and respond with generosity and opportunity. Always remember to thank the service providers who make this work possible and relevant; treat them as collaborators. Sustainable relationships are part of what makes it possible for an independent record label to succeed for 30+ years. Be resourceful and do your research; ask questions and educate yourself. Read books and watch tutorials. Develop a versatile skillset. Stay current. Google is a great resource… Lynda.com is super useful for learning software at all skill levels. If you want to work in the music industry–listen to music and attend a lot of shows. I have always been a consumer of music but aside from coveting 4AD records when I was 16-17, I didn’t collect vinyl until I started working in the industry. I wouldn’t refer to myself as a “vinyl collector.” I knew nothing about the vinyl industry before working at Merge–now, it’s my favorite part of my job. I am no purist–I will never argue that vinyl is the only or even the best medium for listening to music. But, I am a collector of things that matter to me and I suppose vinyl has become one of those things. I’m usually very selective about the new vinyl that I buy or keep; it must feel timeless to me and have an attractive package, otherwise I don’t want it taking up precious real estate on my shelves. Making records feels like magic to me in much the same way that photography did when I would work in the darkroom. It’s art and science. Light and sound–forms of energy that travel in waves. Handling a record makes me conscious of that in a way that I don’t experience with a CD or digital, but I’m not going to fuss with vinyl if I’m hosting a party or cooking. I took over this position just as new plants were opening and helping relieve bottlenecks in vinyl manufacturing. At that time, we were only using two plants to manufacture the majority of our vinyl. Now, I work with eight different plants, and that’s after having narrowed it down! That is a lot for a label our size; but until things feel more predictable and streamlined, flexibility is key to meeting the needs of our artists and consumers. I will make a choice on where to send something based on the schedule, quantity, artist, size (7, 10, or 12 inch), location, and what kind of special effects or color vinyl we need. With so much competition, quality and service are improving across the industry. Until fairly recently, I would try just about anyone once. I won’t use them again if I wasn’t impressed, and now that I have a solid base of trusted partners, I’m no longer entertaining solicitations from new plants. Honest, timely communication is hugely important and I’m lucky to have enough options to be able to choose to only work with plants who can provide that. I think there’s a misconception that it’s older, middle-class collector-types buying vinyl. But if you look at the numbers, the percentage of younger people buying vinyl is significant. Vinyl geeks love to make fun of the kids who buy their vinyl at Urban Outfitters to listen to on their Crosley turntables. Sure, I’d advise against buying a Crosley, but music should be accessible to everyone, regardless of income or education. If a cheap, portable turntable is the spark needed to ignite someone’s interest in the history and medium of vinyl, so be it. One of the best things about music is that it has the power to reach people in ways that no other art form can. You don’t have to be an audiophile to participate. If audiophiles were the only people buying vinyl, the industry wouldn’t be what it is today. I am currently obsessed with collecting everything released by the Dutch label, Music From Memory. Favorites include “Outro Tempo” and Roberto Musci’s “Tower of Silence.” Currently listening to Richenel’s “La Diferencia” EP–also great.